Bye, Bye Summer… Hello Fall! Okay, it’s with mixed emotions that we would like to point out that summer is almost over. We just celebrated Labor Day, the unofficial end of summer. Hopefully you were able to celebrate poolside with friends and family close by! Our grill was full of summer favorites like hamburgers, grilled chicken and asparagus accompanied by fresh tomatoes and mozzarella. Now, though, it is time to start looking ahead to fall and the wonderful fruits and vegetables that are soon to be fresh and in-season! 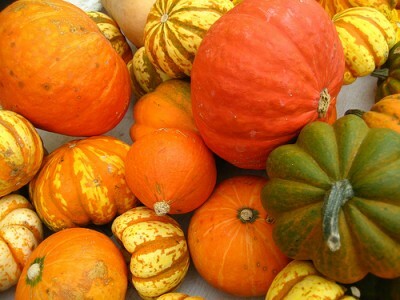 The scents of fall are often centered around pumpkins and flavorful spices like cinnamon and nutmeg. It’s no wonder because fall is notorious for its various types of squash. These vegetables thrive during this time of year. So, take advantage of it. Winter squash, as this variety is commonly known, are a great source of antioxidants, , as well as Vitamins A & C and dietary fiber which is great for our digestive systems. Another great use for many winter squashes are their seeds. Baking the seeds with your choice of flavoring makes a great, low-fat snack. Simply baking pumpkin seeds with a light amount of salt provides an inexpensive snack that you can enjoy on-the-go, or send to school with the kids! Peaches are a great fruit that thrive in the fall. These fruits are freshest, juiciest and just plain yummiest during this time of year. There are many ways to enjoy a peach. However, we still contend that slicing up a fresh peach and savoring the flavor as you bite in to each slice is the best way to enjoy this fruit! You can also whip up some of the traditional peach recipes including peach cobblers and pies, as well as fresh peach preserves. However, it’s always fun to think outside the box. Sweeten up your salad a bit too! Try making your own poppy seed dressing and tossing it with fresh lettuce and diced peaches. This recipe is sure to be a decadent treat for your palette. So, as disappointed as we are that summer is coming to an end, this bittersweet moment opens up the door for a new season; fall! This fall, take some time to enjoy all the fruits and vegetables the season has to offer! You may be surprised at how much you’ll love what you find! Plus, always remember, according to the new USDA guidelines and MyPlate, half your plate should be filled with fruits and vegetables. So, why not fill it with fresh, fun seasonal fruits and veggies! I certainly look forward to preparing the different types of pumpkins that will appear in the sores, and biting into a crisp apple that has recently been picked. That’s great Colline! We definitely look forward to all those things too!